Good evening, FighterSweep Fans! You’re about to see some great footage from a GoPro attached to the cranial of a VFA-87 “Golden Warriors” troubleshooter. The “shooters,” as we call them, are a Navy flying squadron’s maintainers and are selected from the best of their respective rates. These professionals reside in a squadron’s “line shack” and have a number of important responsibilities entrusted to them. Much like the Dedicated Crew Chiefs in the Air Force, the troubleshooters can plug into the jet and talk directly to the pilot to help him resolve a discrepancy he can’t fix with his knowledge alone. They also help with the “final checking” of an aircraft before it goes flying–whether from the flight line at home or the flight deck at sea. 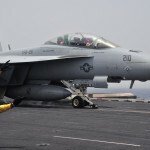 Known for their white checkered flight deck jerseys, they will do a final sweep of major aircraft systems as the McDonnell Douglas (Boeing) F/A-18C Hornet prepares for launch. In this video, as the “War Party” jet taxis into position on Cat 3, this shooter checks everything along the starboard side of the jet. Working aft, he’ll start with the radome and move to the various probes and antennas, as well as the nose gear doors. As he moves to the wings and past an AIM-7 Sparrow, you’ll see him pass the “lock the wings” arm signal at 00:29. In the legacy hornet, the pilot has to positively lock the wings after they’ve been spread. Once locked, a cylinder atop each wing known as the “beer can” will drop into the wing, and the ailerons will begin to droop, signifying the wings are now locked into position. You’ll see the shooter verify this by jumping to see the top of the wing right afterward. You then see the shooter check the external fuel tank and inspect the right main gear and wheel well–all while the jet is taxiing to the catapult! Once he’s satisfied that everything is good to go, he will move to his final position and prepare for the last phase. The green shirts do their good work, where they hook up the holdback fitting to the nose gear and help guide the launch bar into the catapult shuttle. After the aircraft is put in tension and ready to launch, a different kind of shooter (the one that shoots him off the flight deck, not a troubleshooter–the name is a coincidence) will instruct the pilot to run up his engines up to military power and “wipe out” the controls. The troubleshooter will ensure all the control surfaces he’s assigned to inspect move appropriately. He also will ensure there are no leaks or any other issues in the last moments before launch. Satisfied, he can pass a thumbs up high in the air. Only then with the thumbs-up and pilot salute will the aircraft shooter touch the deck and launch the jet. Without the troubleshooter’s thumbs up, that plane isn’t going anywhere. Period. Needless to say, on shore it’s a little different. The shooter won’t inspect the jet while at full power, but will check it out before the pilot taxis out of the line. Let me tell you, the shooter’s high level of professional knowledge and attention to detail has led my jet to being called down more than once. Small things that can evade a pilot on preflight, that could turn into serious emergencies in the air if not found during final checks, are the shooter’s specialty–and they’re amazing at it. 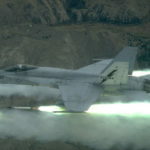 We hope you enjoy this video of a shooter in his element: final-checking a Hornet in the most dangerous work environment on Earth!